One can really consider Torremolinos to be three resorts in one. Firstly there is the main town in the middle, secondly, on the Málaga side are the modern Bajondillo and Playamar areas and thirdly, on the other side is the older area of La Carihuela. 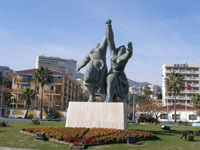 In the early 1980's, Torremolinos was at the heart of the package tourism boom to Spain. Due to this influx of people it did get rather a checkered reputation as a noisy and rowdy resort - much like those that can still be found on some of the Mediterranean islands! In more recent times, things have changed very much for the better and it is now considered a resort that has something to offer just about everyone. Torremolinos now has its own promenade (or paseo), which is a continuation of the one to be found in Benalmadena. In "Torre" however, its many beach bars - known locally as chiringuitos - distinguish the promenade. Many of these are actually very good fish restaurants and you'll find a few that are notable music bars amongst them. It has been said that you can walk along the paseo at almost any time of day or night and find something to eat or drink. The town centre features the famous shopping street of "Calle San Miguel" which winds down from the main street almost to the seafront. Along this street and its many side streets you'll find numerous little shops selling just about anything! The paseo has now been extended towards Málaga and it is now possible to walk along it from the far side of Benalmadena, past the area known as Los Alamos, which is just a short walk from the famous "Plaza Mayor" complex.